Everybody knows about the wonderful things that dogs bring to our lives, but there’s one thing that nobody ever tells you about – the weird and wonderful array of smells that these furry critters can produce. Dog flatulence is just one of the distinct aromas that will start to become a part of your life. Amusing though it can be when a dog toots in their sleep and wakes themselves up with a shocked look upon their face, trapped wind can be painful for your pooch. Let’s take a look at the variety of methods that are available as a source of dog gas relief, and how you can help soothe a bloated belly after your dog overindulges or eats something that doesn’t agree with him or her. 1.1 Are Specific Dog Breeds More Prone to Gas and Bloating? 2 What Can You Give a Dog Who Has Gas? 2.4 Can You Give a Dog Pepto-Bismol? 4 Can Dogs Get Colic (Trapped Wind)? If your dog has gas, you’ll know about it – the smell can be enough to cause birds to drop from the skies. 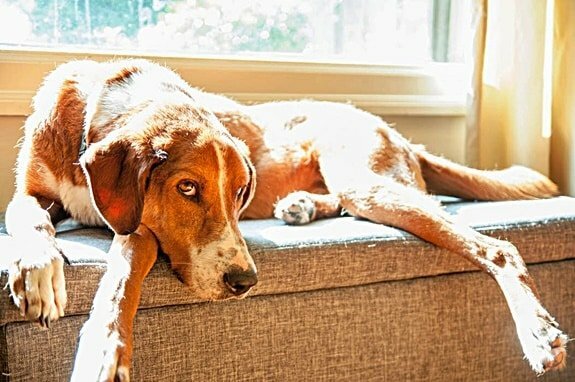 If your dog lives with a constant flatulence problem, it’s probably worth speaking with a vet, as it could mean that your hound is in some kind of discomfort and living with a health condition. The same also applies if your dog is prone to the occasional bottom belch but they are suddenly emitting particularly toxic-smelling releases. If it appears to be a recent or temporary development, however, there could be many reasons behind these strong winds. Eating Food Too Quickly. If your dog was particularly hungry and gobbled their food down at a rate of knots, they may have swallowed a lot of air in the process. This will need to be expelled. If your dog is prone to munching their meals too quickly and then releasing them back into the atmosphere in gaseous form, look into a feeding bowl designed to slow down a feeding frenzy. Change in Diet. If your dog has undertaken a sudden change in diet – moving from wet food to kibble, for example, or vice versa – it will have an impact upon their digestive system. More often than not the result will be diarrhea, but there may be a few releases of gas in between bouts of tummy trouble. Low-Quality Food. Dogs need nutrition from their food, so naturally the higher quality the meals they are provided with, the better. Food at the very bottom of the quality control chain will be filled with all kinds of additives to make it palatable to Fido, and as a result, your dog will struggle to digest it properly. The result will be all kinds of stomach problems, including gas. Consumption of Unfriendly Foods. Not every food that is unsuitable for dogs is toxic and will necessitate an emergency trip to the vet, but many will still leave Fido feeling thoroughly uncomfortable. Many dogs are lactose intolerant, for example, but love cheese – finding the right amount to provide as a treat is a very fine line and exact science. Spicy human food and too many vegetables will have a similar impact on a doggy colon. Once they go in, they’re going to make their way out one way or the other – in either gas, liquid or solid form. Other Health Conditions. There are many health conditions in dogs that lead to flatulence, so let us repeat what we said before – if your dog seems more gaseous than usual, make an appointment with a vet. Your dog may have developed Irritable Bowel Disease, be living with an unwelcome parasitic invader in their colon such as a tapeworm, have an excess of unfriendly bacteria in their gut, or may even be suffering from something horrifying such as a tumor. As always with dogs, if you’re in any doubt at all, get them to see a professional and set your mind at rest. Are Specific Dog Breeds More Prone to Gas and Bloating? Yes. Flat-faced (aka brachycephalic) breeds of dog such as Pugs, Boxers, and Bulldogs are famous for struggling to manage their gas. This is primarily because their unique biology makes it difficult for them to breathe at times, meaning that they take in more air than they strictly need at times. The same way happens for large, famously food-crazed dogs such as Labradors – they’ll eat anything in sight, usually not pausing for breath between chews, meaning that they too will take in a great deal more air than usual. As we have just explained, when air enters your dog’s body is needs to be released again in whatever form is fastest and most comfortable for Fido. If you bring one of these dogs into your family, learn to embrace the unique scent they bring with them – and think about opening some windows around the house! Popping a cork into the bottom of your dog to prevent their gaseous releases is understandably frowned upon. However, if you’re fed up with spraying air freshener and can’t bear the sight of another scented candle, take a look at some remedies for canine flatulence. 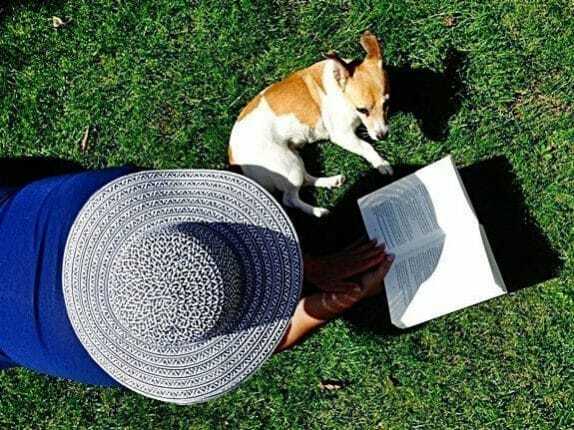 The first thing that you can do to put a stop to Fido’s wind is making many lifestyle changes – with luck these will put a stop to the problem and cease the need to look into further assistance. Get Plenty of Exercise. It’s believed that an active dog is far less likely to have a flatulence issue than a lazy, pampered pooch. If your dog tends not to ask for walkies, do what it takes to encourage them to get outside more often. If nothing else, maybe they’ll pass wind outdoors where you won’t need to deal with it! Change Your Dog’s Diet, and Stop Feeding Them Scraps. If your pooch currently eats canned dog food, switch them onto something less nutritionally challenged. Kibble is generally fine provided your dog is getting a full range of nutrients – bland is a good thing for dogs. Stop Fido from helping himself to the leftovers on your plate or tucking into anything else that is not designed for him. Encourage Your Dog to Eat Slower. As we have discussed, many flatulence symptoms stem from dogs swallowing too much air while chowing down. Consider feeding your dog two, smaller meals per day several hours apart if they seem particularly famished by dinnertime and empty their bowl in the blink of an eye, or look into a specialist bowl designed to slow down feeding. You should also leave your dog’s food bowl in a quiet place where nobody else – including other pets – will tend to venture. This will ensure they’re calm while they are eating and not worried that the food will be taken away from them. Use a Dog-Friendly Probiotic or Supplement. Your vet will be able to recommend something suitable, potentially based on the results of blood tests and allergy examinations. Your vet may have a variety of different medical treatments for excessive gas, most notably when it relates to a bacterial infection. If you’re worried about your dog and the stenches they are creating, seek professional help to get it investigated. If you’d prefer to treat your dog’s gas using homemade remedies, many different herbs will do the trick. Just be warned, the problem may get worse in the short term before eventually getting better – think of it as a purge of anything unwanted from your dog’s insides. Keep feeding these herbs to your dog in conjunction with the lifestyle changes above, and you should find that the air around your dog is infinitely fresher smelling. Can You Give a Dog Pepto-Bismol? That little pink bottle is a sign of relief to many people, with Pepto-Bismol an essential addition to the medicine cabinet. It’s one for humans to guzzle down this liquid relief, though – is it safe for a dog to have their stomach complaints eased by the same substance? The answer is yes… with a sizable number of caveats. Pepto-Bismol is not directly toxic to dogs (though, conversely, it is poisonous to cats) and it may have similar soothing properties to humans, but it needs to be used very, varying sparingly. At the most, use one teaspoon for every 10 lbs. of your dog’s weight, and don’t offer the medication twice within the same 8-hour period. The most effective way of getting Pepto-Bismol into your dog’s system is to pour the medication into a syringe and squirt it straight into Fido’s throat. It’s probably advisable to seek professional advice opening the bottle though, in case your dog has any allergies that need to be taken into consideration. If it works, however, why does Pepto-Bismol come with such concern? The short answer is the presence of salicylates in the medication, which could cause the stomach lining to start bleeding. 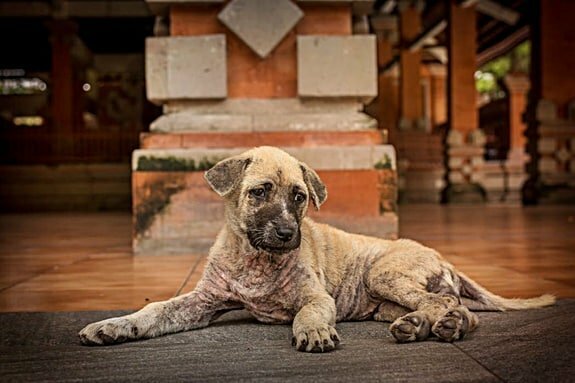 Worst of all, some of the chemicals found within will also turn your dog’s stool dark, or maybe even black – masking the sight of the blood and preventing you from seeking help from a vet. If the information above leaves you reluctant to use Pepto-Bismol, there are a handful of alternative OTC remedies that you could look into. These include Pepcid and Imodium, although the latter is more closely linked to relieving diarrhea. We’ve taken a slightly tongue-in-cheek approach to the subject of dog flatulence, but a bloated stomach is no joke for Fido. It can be hugely painful and uncomfortable, and potentially fatal if left untreated and ignored. The medical condition Gastric Dilation Volvulus, twists the stomach of a dog when there is too much air trapped within. This is usually caused by anxiety or sudden changes in diet – and it’s considerably more severe than straightforward bloating caused by eating or drinking too much. Firstly, understand the symptoms of GDV in your dog. If you suspect that your dog is suffering from GDV, get them to see a vet as quickly as you can. Time is of the essence where this condition is concerned, as it can become life-threatening within an hour. If your dog has a bloated stomach but no pain they may just have overindulged themselves with treats or snacks, or at the water bowl. However, although this sounds considerably less serious than GDV, it can be just as dangerous – especially in the case of excess fluids, which may lead to overhydrating. At one time or another, almost every pooch parent has asked why their dog is so thirsty all of a sudden. Dogs fill up on water for a variety of different reasons, and thankfully not all of them point to an illness, although it is well worth getting your canine companion checked out to ensure that they’re not living with Diabetes or Cushing’s disease. Whatever the reason for your dog filling up on fluid, their body is only so big – all that water needs to go somewhere. Obviously,y the only real solution is to encourage your dog to urinate as if they leave this water sloshing around their system they are at risk of causing permanent damage to their kidneys. If your dog is refusing or struggling to urinate and pass this water, it points to a more serious problem that will need to be quickly addressed. 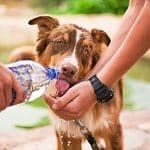 The actions for dealing with a dog that has drunk too much water are similar to the things that you MUST do you if your dog is dehydrated – namely, get them to a vet for professional help. Under no circumstances just ignore this and hope that it goes away, as your dog may have drunk to excess and is living with the life-threatening symptoms of hyponatremia, or water intoxication. Can Dogs Get Colic (Trapped Wind)? Yes, Just like humans young and old, dogs can experience trapped wind. Thankfully, this is usually not quite such as worrying or dangerous as something like GVD – though also just like in humans, Colic can still be very, very painful for your poor pooch. Firstly, remember that your dog can’t tell you when they are in pain so you’re going to have to vigilant about learning the signals. Canines will usually communicate this through their body, so brush up on what tail positions mean – it could help you administer some doggy first aid sooner rather than later. Keep an eye out for any of these symptoms, and read on to learn how you can soothe your dog’s discomfort. If you’re confident that your canine is living with trapped wind, you should first find out if the problem is acute (a one-off, caused by eating something inappropriate) or chronic (due to some kind medical concern or parasitic invasion of your dog’s colon). If it’s the latter, you should seek professional help to treat the problem with some kind of medication, as this will deal with the root cause and prevent your dog from living in regular pain and discomfort. 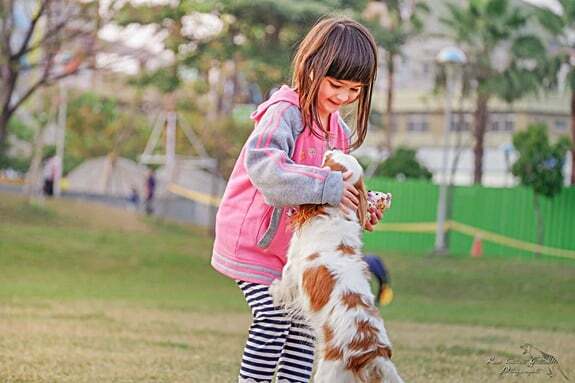 If you’re happy that this has been a solitary incident caused by misadventure, however, take a look at some methods for restoring Fido’s intestinal equilibrium. Winding a dog is just winding a human baby, with a little more emphasis on the tummy than the back. Very gently massage your dog’s swollen stomach, then start massaging the back at the same time and ensuring that you work your way towards their rear end. Eventually, your dog will start to make a noise that denotes their approval – usually a squeak – and then you’ll soon realize that their wind is no longer trapped but roaming free. You might regret their actions in the short term when the aroma reaches your nose, but you will have earned yourself a whole lot of facial licks for your trouble! Inflammation of your dog’s stomach lining may well be at fault for their bout of Colic, especially if they have been munching on wild plants and flowers or rooting through your garbage bin for a secret treat. However, prevention is superior to cure in this instance. If your dog has an ulcer, they will be in clear distress, and you should do whatever you can to prevent this from happening again. If your dog does have trapped wind and your vet cannot seem to pinpoint a medical reason, there may be some lifestyle changes that you can implement that will ease their symptoms. Give your dog a high-quality, balanced diet – but don’t make the change immediately, as that will cause more stomach issues. Gradually introduce the amended food on a 90/10 basis in favor of their old meal, gradually increasing the ratio of new food over a period of two weeks. Discuss the possibility of dietary supplements with a vet. You may be able to add something to your dog’s diet that will help keep their digestive tract in tip-top shape, especially as they start to grow a little older. 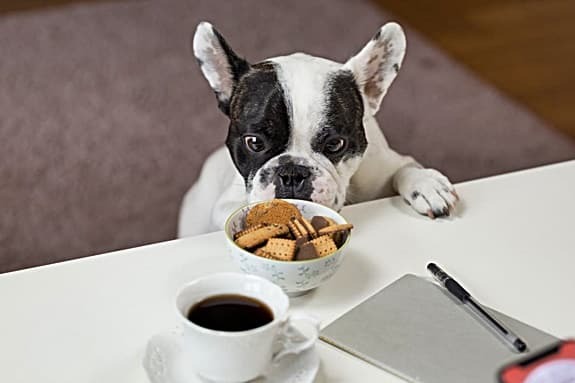 Make sure that your dog is not munching on table scraps, raiding the trashcan, consuming potentially toxic or irritable plant life, or eating too many high-sugar treats. Ensure that your dog is drinking fresh, clean water regularly. Tap water should be fine, but Fido will never complain if you are prepared to offer bottled mineral water instead. Keep up-to-date with worming your pet, and be sure to check them for any signs of infestation. That doesn’t necessarily mean rifling through Fido’s poop with a flashlight (and you have to do that, for the love of all that is holy make sure you wear gloves) – just watch out for symptoms such as bloody diarrhea, regular dragging or scratching of the bottom, and lethargy alongside a bloated stomach. Colic in a dog may not be life-threatening, but it is dangerous and deeply unpleasant. In fact, given the choice between the two, even the most flatulent-adverse would probably agree that Fido’s gas is better out than in. No matter how your canine reacts to gas and bloating, ensure that they receive the necessary love, attention, and treatment to make them feel better. Your dog can’t nip to the drugstore himself or herself, so they’ll be relying upon you to do what is necessary. Does a Dog's Tail between Legs Mean It's Sick? What Tail Positions Mean!